All my life, i have been a student of history. I had a great history teacher in the 7th grade, and he greatly enlarged my interest in the subject. History was the only subject i received A's in. My first interest was ancient Rome and I read Caesars Commentaries, Tacitus, and several others which I have in my library and study to this day. Homer, Plutarch, Herodotus are some of my others favorites. I have also read Gilmagesh and other similar techs, and am currently seeking more information on early Phoenician voyages, especially those voyages to the Americas. During the last 25 years I have become interested in Bible history and archaeology and have done much reading /study on this subject. The works of Josephus and other Hebrew writings are invaluable on this. I also have several historical novels such as Micheners "the Source", Mailers "Ancient Evenings" Waltari's "the Egyptian". The cover has fallen off my ""25 centuries of sea warfare" !! and nearly so my "Strategy" by Liddell Hart. Sadly in my yard mold keeps eating my veggies so i've given up on that for now :( .....However,I have a Santa Rosa plumb tree Its June 26, I'm eating plumbs every day now !!! SO much better than anything I can get in the store!! and I have a Freestone peach tree,The peaches are all gone now, but were very good !! and my razeberry bushes which are trying to take over the neighborhood!! !...haveing a few berries now. !!! with my best friend Kermit, of course !!! According to Matthew ch 24, Psalms 48 and 102, Jesus is comeing in the lifetime of the people that saw Israel reborn as a nation. These are allready 65 to 75 years old. ................................................... History, Government and Civilization ....................................... By Lewis Brackett.. The CIA created al Qaeda, the database and instigated Islamic fundamentalism by training 100,000 fundamentalist Muslim mujahadeen. “Zbigniew Brzezinski not long ago revealed that on July 3, 1979, unknown to the American public and Congress, President Jimmy Carter secretly authorized $500 million to create an international terrorist movement that would spread Islamic fundamentalism in Central Asia and ‘destabilize’ the Soviet Union... The CIA called this Operation Cyclone and in the following years poured $4 billion into setting up Islamic training schools in Pakistan (Taliban means student). Young zealots were sent to the CIA's spy training camp in Virginia, where future members of al Qaeda were taught ‘sabotage skills’ - terrorism.” It was Camp Peary, where young Afghans, Arabs from Egypt and Jordan, and even some African-American black Muslims were taught “sabotage skills”. ..................................................... ..................................................... There has been a battle over our history in the last century with those who would change our society into a peoples soviet . Their approach is that of altering our history books to defame the lives and the actions of the great founders of our republic, and to show that the only way to national salvation is through national socialism !!! This insidious cancer has had a great effect upon our society, so that this anti-GOD philosophy is taught throughout our schools and colleges, elevating man to be his own little god through the religion of Humanism and Darwinism. .................................................. To fully change society into their own image, they believe that Christianity must be assimilated into their movement by corrupting its message and changing its goals from saving souls to promoting a social gospel. ......................................................... The insistence of historical bible believing Christianity as the ONLY way to GOD and the ONLY moral objective truth is the main obstacle and enemy of their actions and goals, and therefore their main enemy. It is obvious that the present historical evidences when compared to Bible Prophecy show that a time must shortly come upon all the world that will fulfill these peoples ambitions in the establishment of the dreaded all powerful world Socialist/ Marxist state. ..................................................... Liberals are Delusional !!! 2 Thessalonians 2:10 And with all deceivableness of unrighteousness in them that perish; because they received not the love of the truth, that they might be saved. ........................................................ ........................................................ History of Civilization ....................................................... Of course, the most important thing about this history is that it is not primarily a human conspiracy. That is where so many of the secular anti-internationalist groups like the John Birch society have gone wrong !!! Books like "This present darkness" and "Piercing the Darkness" are good examples of this fact. The quest for a one world state which Satan could preside over has been evident through out history, and the insatiable lust for more, for power and money have driven tyrants throughout the ages on their mad search for power. James 4:1 From whence come wars and fighting's among you? come they not hence, even of your lusts that war in your members? 2 Ye lust, and have not: ye kill, and desire to have, and cannot obtain: ye fight and war, yet ye have not, because ye ask not. ...................................................... Time and space here will not suffice to speak on the great world empires, that Of Assyria, Babylon, Greece, Rome. And lately the mighty British empire upon which the sun never set. These have all had their moment in the sun, made a brief noise, and now are dust. Through the madness of them all the Jews have lived, as one separate race, preserved by the power of GOD as a people separate among the nations, for a time such as this. ..................................................... Indeed, the greatest witness of the power, majesty and presence of GOD is the Jew.There are no Babylonians, Assyrians, Romans today, they have been assimilated intoThe whole earth, yet the Jew is as He has always been, a separate people called out from among the nations for HIS divine purpose. ..................................................... The beginning of the 20th century saw the development of the final plan to bring about a one world state. The records of the great industrial foundations show that a debate raged amongst them as to the best way to achieve revolutionary change, and to sweep away the old kingdoms of Europe. ........................................................ After much debate it was decided that War was the only mechanism they could use to achieve their ends. And so they manipulated politics and economics to this end. With the first world war they destroyed several empires, and set up through their financing the soviet state as an anthesis to their goals, to use as an enemy to cause Europe to unite. See "Tragedy and Hope" by Quigley among others. ...................................................... During the 1st world war these elites gave 60 million dollars to finance the Russian revolution in order to create an enemy the fear of which would eventually help unite Europe twords a New World Order. The United States refused to join the League of Nations, however, and it was seen that further war was necessary to further their aims. After the chaos, a United Nations was established which was used to push forward the basis for a world state. After the fall of the Soviet union the"unifying enemy"suddenly vanished so at the present time the radical Muslims are being empowered to be the final enemy that will cause the world to accept a one world state as people cry out for "peace and safety". Very soon now, the final world state will be proclaimed as Satan reveals his man that we know as the Anti-Christ to rule. This will fulfill satins dream to indwell him and be worshiped as a god, in the temple of GOD. We now see the fulfillment of history and prophecy, and the soon coming of the One world state, the 7 year tribulation, and finally the rule of Jesus for 1000 years. <<<<<<<<<<<<<<<<<<<<<>>>>>>>>>>>>>>>>>>>>>>> References : www.clubofrome.org www.tribulation.com www.askelm.com http://nwo-warning.tripod.com/tenregions.html "Tragedy and Hope" by Quigley "peace, prosperity and the come holocaust" by Dave Hunt...."hidden prophecies in the psalms" by J R Church ,S W Radio Church....Hal Lindsay's books," Late Great Planet Earth " and MANY others"Beginning of the end "by John Hagee "Beginning of the end"by Tim Lahaye and of course many others !!! 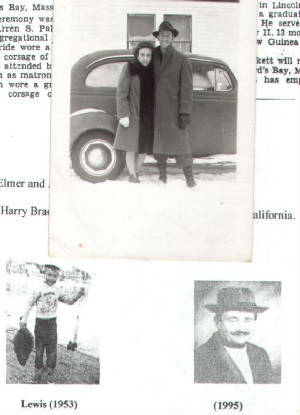 My Mom and my Dad about 1948, and me !!! Praise music/ "Shout to the Lord"